The Camanche Jr. Lego League Robotics team has been chosen to compete in the 2019 World Expo in Detroit, Michigan in April. 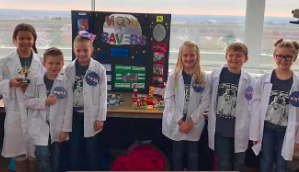 The Moon Savers, a third-grade team, was one of 60 teams selected for this honor from among the 20,000 Jr. Lego League teams throughout the world. Members of The Moon Savers are Beau Bigwood, Jenna Dunlap, Archer Kelly, Autumn Klahn, Mia Macke, and Kennedy Melchiori. They are coached by Sheryl Kennedy, Camanche Elementary School Gifted Education teacher. The Jr. Lego League program introduces students to engineering and science concepts. The participants research a real-life challenge. They learn basic coding skills and follow the engineering design principles. In addition to the research and coding components, the students also develop presentation skills. There are approximately 126,000 children from 55 countries who participated in the 2018-2019 Jr. Lego League season. Jr. Lego League is part of FIRST (For the Inspiration and Recognition of Science and Technology). FIRST is the world's leading nonprofit advancing science, technology, engineering and math participation by children. There are four age groups in FIRST. The Jr. Lego League participants are in the youngest group. In the 2018 World Expos, there were more than 30,000 students from 74 countries participating of the nearly 700 invited teams. The number of participants for the 2019 World Expos are expected to be similar.